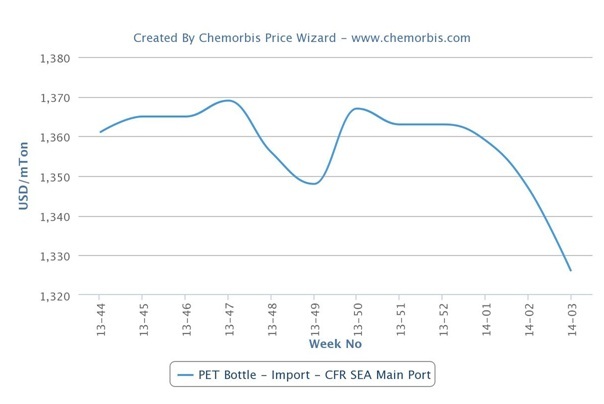 PET prices in the Southeast Asian market have seen downward pressure from upstream costs and weaker demand, which in part, stems from the Chinese New Year holiday that will start at the end of this month as per the pricing service of ChemOrbis. In the upstream markets, Asian spot prices lost $20/ton for MEG, $40/ton for PTA and $90/ton for PX when compared with the levels at the end of December. Meanwhile, NYMEX crude oil futures prices lost $6.36/bbl when compared with the last December assessments, prior to the New Year holiday. In the naphtha market, offers shed around $50/ton on a CFR Japan basis from late December levels. 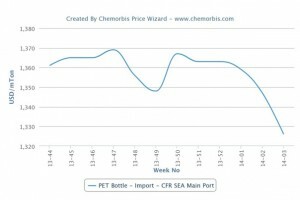 According to ChemOrbis, a PET bottle manufacturer operating in Vietnam reported receiving steady import PET prices from their regular Thai and South Korean suppliers but added that they are confident about being able to achieve $10-20/ton discounts since demand is not strong at all and Chinese cargoes are offered at more competitive levels in the market.